So newly reelected Israeli monster-in-chief Benjamin Netanyahu has boasted, with a grin, that America's President Donald J. Trump followed through on his proposal to declare the Iranian Revolutionary Guard Corps (IRGC) a terrorist group. Bibi was smiling because the timing of the move, one day before the Israeli election, strongly suggests it was done to assist him against what had become a very strong opposition challenge. 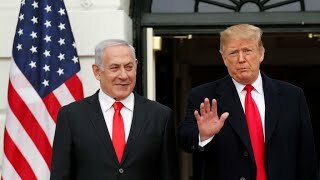 That Trump likely colluded with Netanyahu to blatantly interfere in the election has apparently bothered no one in Israel or in the tame American media. The gift from Washington came on top of recognizing Israeli sovereignty over the Golan Heights, threatening members of the International Criminal Court if they try to prosecute Israel for war crimes, moving the U.S. Embassy to Jerusalem, removing the word "occupation" from the State Department's assessments of human rights infringements on the West Bank, eliminating relief funding for Palestinian refugees, leaving the U.N. Human Rights Council because it was too critical of Israel, and looking the other way as Israel declared itself a state only for Jews. Washington also ignored the bombing of hospitals, schools and water treatment infrastructure in Gaza while Israeli army snipers were shooting unarmed demonstrators demanding their freedom. The labeling of the Revolutionary Guard as a terrorist group is particularly disturbing as it means that the United States military, by virtue of the Authorization to Use Military Force (AUMF) now has a mandate to attack the IRGC wherever it appears, including in Syria or even in the waterway the Straits of Hormuz, where the guard has regular patrols in small boats. It is a de facto declaration of war and it comes on top of a number of deliberate provocations directed against Iran starting with the withdrawal from the nuclear agreement Joint Comprehensive Plan Of Action (JCPOA) one year ago, which led to the unilateral imposition of harsh sanctions directed against the Iranian economy to bring about a popular uprising as well as regularly repeated false claims that Iran is the leading "state sponsor of terrorism." Next month, the U.S. will begin enforcing a unilaterally declared worldwide sanction on any and all Iranian oil sales. And Trump will no doubt expect Bibi to return the favor when he is running for reelection in 2020 by encouraging American Jews who care about Israel to support the Republicans. Trump is focused on his own electability and is absolutely shameless about his betrayal of actual American interests in the Middle East, possibly because he has no inkling of the actual damage that he is doing. His speech last week before the casino multi-billionaire Sheldon Adelson-hosted Jewish Republican Coalition Annual Leadership Meeting in Las Vegas was a disgusting pander to a group that includes many key players who have little or no concern for what happens to the United States as long as Israel flourishes. The only good news that came out of the meeting was that Adelson himself appears to be "gravely ill."
Trump at times appeared to be speaking to what he thought was a group of Israelis, referring to "your prime minister" when mentioning Benjamin Netanyahu and several times describing Israel as "yours," suggesting that deep down he understands that many American Jews are more loyal to Israel than to the United States. At another point, Trump declared that "The Democrats have even allowed the terrible scourge of anti-Semitism to take root in their party and their country," apparently part of a White House plan to keep playing that card to turn American Jews and their political donations in a Republican direction before elections in 2020. Trump also told the Republican Coalition audience how he came to a decision on recognizing Israel's sovereignty over the Golan Heights. He described how "he'd been speaking to his son-in-law and senior adviser, Jared Kushner, as well as U.S. ambassador to Israel David Friedman and his Israel adviser, Jason Greenblatt, over the phone about an unrelated issue when he suddenly brought up the Golan Heights." Trump shared how "I said, 'Fellows, do me a favor. Give me a little history, quick. Want to go fast. I got a lot of things I'm working on: China, North Korea. Give me a quickie.' After the advisers filled him in, Trump said he asked Friedman: 'David, what do you think about me recognizing Israel and the Golan Heights?' Friedman, apparently surprised by the suggestion, reacted like a 'wonderful, beautiful baby,' Trump said, and asked if he would 'really ... do that.' 'Yeah, I think I'm doing it right now. Let's write something up,' Trump said he responded, prompting applause and cheers from his audience in Las Vegas. 'We make fast decisions and we make good decisions.'" The nonsense going on in Las Vegas in front of a lot of fat cats who regard the United States as little more than a cash cow that they control as well as in the White House itself, unfortunately has real world consequences. America is being led by the nose by a well-entrenched and powerful group of Israeli loyalists and this will not end well. The U.S. doesn't even have a Middle Eastern foreign policy anymore it has a "to do" list handed by Netanyahu to whomever is president. The fact that the current man in charge in Washington is either so ignorant or so deluded as to allow the process to escalate until the U.S. is drawn into yet more catastrophic wars is beyond regrettable. U.S. foreign policy should not depend on the perceptions of Kushner and company. It should be based on real, tangible American interests, not those of Israel. Someone should explain that to the president.